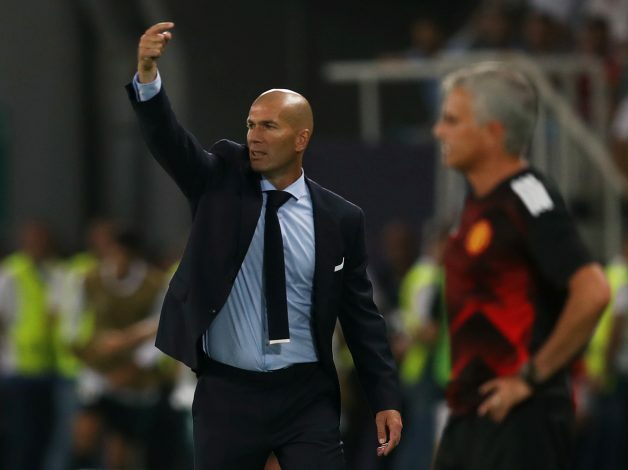 Manchester United may be a club in total free-fall at the moment, but senior sources at Old Trafford have rubbished rumours that current manager Jose Mourinho could be replaced by Zinedine Zidane in the near future. The Telegraph are reporting that any United attempt to lure Zidane to Manchester is pure ‘nonsense’ and that the team is backing Mourinho despite this being the worst ever start to a Premier League season for the Mancunians. United were beaten 3-1 by West Ham United on Saturday, and several eyebrows were raised after Mourinho decided to leave out Alexis Sanchez from his match-day squad, instead handing Anthony Martial an opportunity up front alongside Romelu Lukaku. The move clearly backfired and led to a third defeat this campaign, which has led the Red Devils to fall down to tenth position in the table. Since the defeat, speculation has been rife over the future the Portuguese tactician, with several reports claiming that change was inevitable, and could even take place as early as the end of this week. Staff members have allegedly discussed the possibility of a Mourinho-less Manchester United, and with his very public ongoing spat with certain players in the United set-up, it would be fair to assume that a managerial switch is in the offing. Zinedine Zidane is obviously the first choice to take over if Mourinho does go, with the Frenchman looking for a new challenge after three successive Champions League triumphs with Real Madrid and a reputation of being very understanding with his players – a trait that Jose has been repeatedly accused of lacking. With the dressing room now supposedly split into two already, it may just be a matter of time before officials at Manchester United are forced to consider taking some big decisions with regards to management. As questions continue to be asked, the English giants turn their attention towards the midweek Champions League encounter against Valencia.